Jack Hargreaves smacked 75 for Wisbech at Nassington. Wisbech continue to set a scorching pace at the top of Cambs Division One. The Fenmen have recorded scores of 230, 306 and now 280 on their way to three wins in three matches. The latest run blizt arrived at Nassington yesterday (May 7) who made a plucky response before finishing 37 runs adrift. Ashley Rodgers made 97 for Ketton against Burwell seconds. Aussie Jack Hargreaves top scored at Nassington with 75 - his third succesive half century which enabled his nside to recover vcfrom 59-3 to reach 280-9 in 50 overs. Paul Edgeller assisted with 50 from the number eight position. Nassington started well in reply making 73 for the first wicket, but despite 84 (16 fours) from skipper Alex Laud the home side came up just short. Jamie Gollands (4-30) was the pick of the Wisbech bowling attack. Ramsey are four points behind Wisbech in second place, but they had to fight hard before picking up a third win in a row this season at home to Histon. The visitors compiled a modest 180 at Cricketfield Lane after reaching 79-0 and 113-1, but it looked likely to be enough when Ramsey were reduced to 73-5 and then 110-7. Hero of the hour for the hosts was Jonathan Cade who was unbeaten on 41 when a two-wicket win was completed. Cade added an unbroken 46 for the ninth wicket with Sam Latchford. Ketton are off the mark at the third attempt, They won a tense clash with fellow strugglers Burwell seconds by three wickets at Pit Lane. 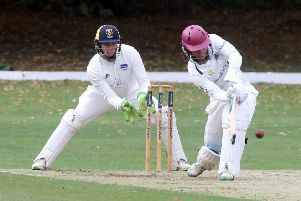 Former Castor star Ashley Rodgers bashed 97 for Ketton as they chased down Burwell’s 219-5. In Division Two there was a shock two-wicket defeat for March Town at Huntingdon, a team they had beaten by five wickets the week before. It could have been worse for March as century-maker Sam Freedman was dropped twice before he had reached double figures. His 100 dominated the March score of 181, but Huntingdon sneaked home by two wickets despite two wickets apiece for Toby Nulty and Andrew Wright. March are second in Division Two, just ahead of Newborough who despatched Warboys comfortably for the second Saturday in a row. David Cooper (44) top scored in Newborough’s 238, but only just as Warboys contributed 43 wides to the total. Skipper Ali Greenwood and Vamshi Parvathaneni both took four wickets as Warboys were bowled out for just 111 in reply. Ufford Park completed back-to-back wins over Weston Colville. Tom Hart (43) top scored in Ufford’s 167, while there was a strong all-round display from Tanvir Hussain (30 & 4-14). Ketton 220-7 (A. Rodgers 97). Wisbech 280-9 (J. Hargreaves 75, P. Edgeller 50, G. Freear 31, D. Haynes 27, A. Morris 3-38, T. Norman 3-52). Nassington 243 (A. Laud 84, T. Norman 40, T. Burns 26no, J. Pope 26, J. Gollands 4-30, G. Freear 2-46, S. Mutubuki 2-51). Histon 180 (M. Wright 66, J. Crame 47, E. Cafferkey 3-12, M. Edwards 3-14, J. Cade 2-22). Ramsey 181-8 (J. Cade 41no, M. Cafferkey 30, B. Mills 25, M. Wright 3-30). March 181 (S. Freedman 100). Ufford Park 167 (T. Hart 43, T. Hussain 30, P. Bentley 27). Newborough 238 (D. Cooper 44, G. Rowland 31, V. Parvathaneni 30). Warboys 111 (A. Greenwood 4-23, V. Parvathaneni 4-33, K. Ellery 2-33).